US listings and review website Yelp, already a big success in the US, launched a UK version this week, which covers the London area and a number of other major UK cities. There are a few local listings sites in the UK already: Trusted Places, welovelocal, Tipped and Yell.com all offer similar sites with local business listings and user reviews, so how does Yelp’s offering measure up? The site has around 16m users in the US, and co-founder and chief executive Jeremy Stoppelman told the Guardian that the UK website is a response to user demand, with many UK residents already using it as a guide when planning visits to the States, and it will no doubt become a resource for tourists visiting this country. The look and feel of the site is broadly similar to its rivals, and the homepage makes it easy to understand what Yelp is all about. The search box is the most important feature for many users of such sites, and is suitably placed in a prominent location on the page, while browsing options are provided for those who want to search by category or look at the highest rated restaurants, nightspots, or other businesses. Whether you browse by category or simply search for a business in a specific area, the search results pages are well presented. The average user reviews are displayed along with a brief summary, while clicking on the restaurant will reveal further useful information such as wheelchair access, suitability for children, price range and more. Results can be sorted by proximity to the location entered, or average rating, while filtering options are effective at narrowing now large sets of search results. If you are searching for somewhere to eat for instance, the filters allow you to specify a general price range, see only restaurants that are suitable for children or have parking nearby, as well as searching by type of cuisine. Google Maps are also used to good effect on Yelp. Search results are plotted on maps so you can quickly see the location of restaurants on the results page, or use the map to search instead. I like the way the map follows you down the results page so you don’t have to scroll up and down the page to see the location of a particular restaurant. Maps are also well utilised on each company’s’ page; the business location is plotted on the map, with an option to get directions there. There is some useful detail on these pages too, and most that I came across contained a good range of reviews, as well as photos of the location and information of nearest tube stations. range of reviews considering it only launched this week. 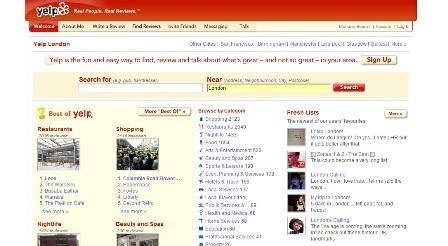 No matter how well designed a site like this is, if it lacks a good range of reviews, it is far less useful. For London at least, there seem to be plenty of reviews so far, though the Yelp team will need to work at getting more reviews for other areas of the country, as there are few reviews for cities like Newcastle and Leeds. I’m impressed with the site though, it is well designed, easy to use, and contains plenty of useful information for residents and tourists alike. There are already some very good local listings sites like welovelocal, so it will have some competition as it attempts to establish itself in the UK.